Interactive map of St. Petersburg metro with subway lines and stations location on the city map. In most cases subway is the most fast convenient, safe and relatively cheap way to get around the city. On the interactive map identifies the location stations and lines Petersburg metro. The list of stations in the right of the menu map. At the bottom of the page you will find information what interesting and useful objects Petersburg located near some of the subway stations. On the pages dedicated to specific theme theaters, museums, shopping places, attractions, railway stations and other places of interest are given nearest to them the metro station. Map will help you plan a trip to the right place to find as it is more convenient to get to your destination. You can also see the map light version for mobile devices (without advertisements and further information). Saint Petersburg. Start your exploration of the city from this page. St. Petersburg attractions. The most interesting places in St. Petersburg. 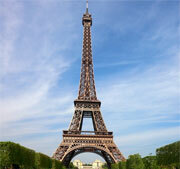 Description, photographs, location, how to get (the nearest metro stations). Theaters. The most popular theaters of St. Petersburg. General information about theaters, location, address, nearest metro station. Saint Petersburg map. Tourist map of St. Petersburg. The map shows location of the most interesting for tourists places (attractions, shops, museums, train stations, airport and other places and objects). Public transport in St. Petersburg. Information about public transportation in St. Petersburg (bus, tram, trolley, subway, airport). As well as some transport infrastructure objects description: railway stations, airport, port. Saint Petersburg Metro - Information for tourists. It may be interesting and useful to know. Events in St. Petersburg. Announcements of the most exciting events, festivals, concerts and exhibitions. 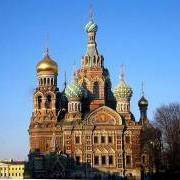 Guided tours in St Petersburg. Image gallery. Photos of the most beautiful places in St. Petersburg. Metro station "Admiralteiskaya". Metro station Admiralteiskaya nearby are located most famous attractions of St. Petersburg: Palace Square and Winter Palace, St. Isaac's Cathedral, the most famous monument to Peter the Great, "The Bronze Horseman". 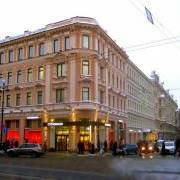 Near the metro station Admiralteiskaya is located one of the most famous hotels in the city - "Astoria". McDonald's restaurant is located at a distance of not more than 100 meters from the station. Metro stations "Nevskiy Prospekt" and "Gostiny Dvor". Metro stations "Nevsky Prospekt" and "Gostiny Dvor" are located about in the middle of the main street of St. Petersburg "Nevsky Prospect." Near metro stations are located : Kazan cathedral, "Savior on the Blood" cathedral, Mikhailovsky and Aleksandinsky theaters, Russian museum, department store "Gostiny Dvor". Nearby are also located one of the most famous buildings in St. Petersburg - "Singer House". Metro station "Gorkovskaya". This is (more information about metro station) the nearest metro station to such popular tourist sites like the Peter and Paul fortress, the Zoo, the Museum of Artillery, Cruiser Aurora. Not far from the station, not far from the banks of the Neva river is located in the first building of Petersburg - "House of Peter the Great." The metro station "Moskovskaya". "Moskovskaya" metro station is located in the southern part of the "Moscovsky prospect" street. Near the metro station is located a hotel "Park Inn Pulkovskaya". To the Pulkovo airport from the subway station is easy by bus (№39).